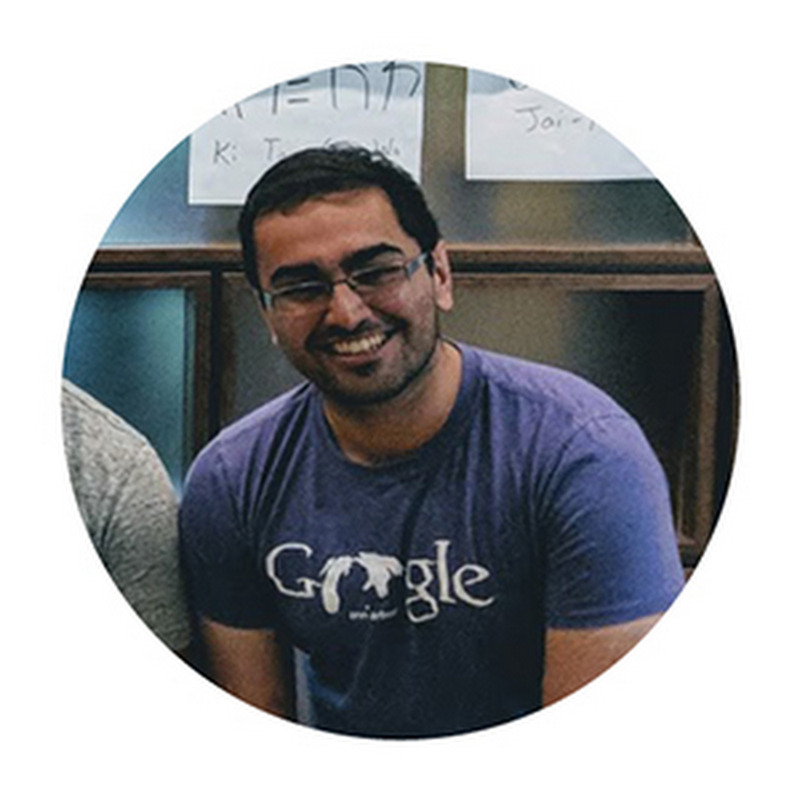 This entry was posted in Google Developers Blog and tagged Diversity, Education, Localization, Women in Tech, WomenTechmakers on April 9, 2019 by Google Developers. Recently, we introduced the Inclusive Images Kaggle competition, part of the NeurIPS 2018 Competition Track, with the goal of stimulating research into the effect of geographic skews in training datasets on ML model performance, and to spur innovation in developing more inclusive models. While the competition has concluded, the broader movement to build more diverse datasets is just beginning. Today, we’re announcing Open Images Extended, a new branch of Google’s Open Images dataset, which is intended to be a collection of complementary datasets with additional images and/or annotations that better represent global diversity. The first set we are adding is the Crowdsourced extension which is seeded with 478K+ images donated by Crowdsource app users from all around the world. 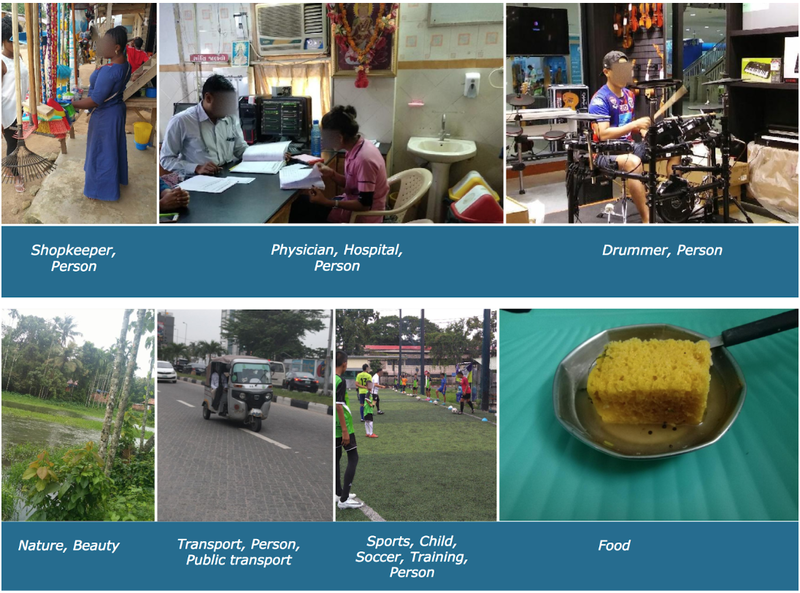 To bring greater geographic diversity to Open Images, we enabled the global community of Crowdsource app users to photograph the world around them and make their photos available to researchers and developers as part of the Open Images Extended dataset. A large majority of these images are from India, with some representation from the Middle East, Africa and Latin America. The images, focus on some key categories like household objects, plants & animals, food, and people in various professions (all faces are blurred to protect privacy). Detailed information about the composition of the dataset can be found here. Pictures from India and Singapore contributed using the Crowdsource app. This is an early step on a long journey. To build inclusive ML products, training data must represent global diversity along several dimensions. To that end, we invite the global community to help expand the Open Images Extended dataset by contributing imagery from your own hometown and community. Download the Crowdsource Android app to contribute images you’ve taken from your phone, or contact us if there are other image repositories (that you have the rights for) that you’re interested in adding to open-images dataset. The release of Open Images Extended has been possible thanks to the hard work of a lot of people including, but not limited to the following (in alphabetical order of last name): James Atwood, Pallavi Baljekar, Peggy Chi, Tulsee Doshi, Tom Duerig, Vittorio Ferrari, Akshay Gaur, Victor Gomes, Yoni Halpern, Gursheesh Kaur, Mahima Pushkarna, Jigyasa Saxena, D. Sculley, Richa Singh, Rachelle Summers. This entry was posted in Research Blog and tagged crowd-sourcing, datasets, Diversity, Open source, Research on December 7, 2018 by Google AI Blog. Our lives are more connected and intertwined than ever before. Togetherness, inclusion, and emphasis on equality for all are paramount, and the workplace is no exception. Although many organizations are championing inclusion and diversity in the workplace, the numbers show that only 11% of Creative Directors are female, less than 6% of the advertising industry is black, and the number is actually declining (Think with Google). Promoting diversity in the workplace isn’t just the right thing to do, it’s also good for business. Diverse teams are proven to be more innovative and creative, not to mention the tangible financial benefits it brings. Despite the clear benefits, the industry still has a long way to go. So what can you do to ensure you’re promoting diversity in your agency too? The first step is to seek out different mindsets. To create advertising that resonates with the vast diversity in the marketplace, we need to seek out and hire talent that truly understands different cultures. So, we asked our partners how they ensure diversity in their agencies and found that 31% focus on embracing diverse voices and leadership. After all, agencies with diverse talent can generate around 30% higher revenue per employee (Deloitte Insights). Diversity is not just about being colorblind or gender neutral - agencies need to start looking beyond educational backgrounds, age, and portfolios too. The focus should be on the raw talent in front of them instead. It’s important to work on creating an industry that nurtures a culture of voice, where everyone feels comfortable speaking up. There’s little point in hiring diverse talent and then asking them to act like everyone else. By embracing different backgrounds, experiences, and perspectives, marketers are in a better position to gain valuable insights that can help them tell more inclusive stories. The hiring process is just the beginning. Far too often the boardroom chairs are occupied by men, and we need to start asking what we can do to change that. It is on us to always ask questions and ensure that we are striving for equality for all, at all levels. Inclusion and diversity have to be more than just a once-a-year initiative. Diversity is an action, but inclusivity is a culture, and an agency’s culture is shaped by the people at the top. It’s important to strive for diversity across all levels, especially leadership. Having different experiences and ideas in the room naturally leads to more creative and diverse solutions, and a culture of empathy and inclusion. A culture of empathy is the ultimate goal, and the company’s culture is defined by its leadership. It is therefore paramount to have diverse leaders and mentors for people to turn to for guidance. Agencies must strive to create a sense of belonging and an environment where everyone feels comfortable. That’s the only way to truly embrace different ways of thinking, and understand the value of the insights that brings to the table. Make diversity an integral part of your business and create actionable, good habits to harness the power of diversity. Make it a habit to show your employees you appreciate their efforts, and that their ideas are valued. This will help transform your workforce into an environment where everyone respects and appreciates the different styles, mindsets, and ideas. After all, a culture where diverse thinking is celebrated attracts talent, improves team morale and employee retention. We care about stories that represent who we are and where we come from more than ever before. 85% of women say that ads don’t represent their real lives because more often than not, they are portrayed in stereotypical roles. To create stories that tap into this underrepresented culture, agencies need to have a deeper understanding and empathy for the audiences they are trying to reach. Brands that represent different kinds of people in a realistic way can make meaningful connections with people that rarely feel a campaign has been made for them. Commit - Diversity of talent must be at the core of everything you do. You must commit to striving for diversity every single day, and when your efforts fall short -- ask why. Not only is diversity in the workplace a moral obligation, it also has immense economic value to businesses (McKinsey). Measure - Data speaks louder than words, so be loud and proud about how diversity is making a positive difference in your agency. Once others see tangible proof and the impact diverse talent can have, they’ll follow suit. Talk - Diversity must be at the core of every hiring decision. Keep the conversation going about your efforts across all levels, and keep asking if you’re hiring talent that will push your creative talent to the next level. Most importantly, agencies must be upfront when they’ve made a mistake and learn from it. Diversity is more than just an HR function, so agencies must take time to analyze their mistakes, so they know what they need to do moving forward. Marketers are in a unique position to reshape the way we think and create positive change. The change won’t happen overnight, but every little step towards where we want to be is a step in the right direction. Check out the video below to find out what other steps you can take to begin your journey to a more inclusive and diverse agency culture. This entry was posted in AdWords Agency Blog and tagged Account Manager, AdWords, Agency, Best Practices, Diversity, Education, inclusion, inclusive marketing, insights, marketing, skills on September 28, 2018 by Camille Rogers. The release of large, publicly available image datasets, such as ImageNet, Open Images and Conceptual Captions, has been one of the factors driving the tremendous progress in the field of computer vision. While these datasets are a necessary and critical part of developing useful machine learning (ML) models, some open source data sets have been found to be geographically skewed based on how they were collected. Because the shape of a dataset informs what an ML model learns, such skew may cause the research community to inadvertently develop models that may perform less well on images drawn from geographical regions under-represented in those data sets. For example, the images below show one standard open-source image classifier trained on the Open Images dataset that does not properly apply “wedding” related labels to images of wedding traditions from different parts of the world. Wedding photographs (donated by Googlers), labeled by a classifier trained on the Open Images dataset. The classifier’s label predictions are recorded below each image. While Google is focusing on building even more representative datasets, we also want to encourage additional research in the field around ways that machine learning methods can be more robust and inclusive when learning from imperfect data sources. This is an important research challenge, and one that pushes the boundaries of ways that machine learning models are currently created. Good solutions will help ensure that even when some data sources aren’t fully inclusive, the models developed with them can be. In support of this effort and to spur further progress in developing inclusive ML models, we are happy to announce the Inclusive Images Competition on Kaggle. Developed in partnership with the Conference on Neural Information Processing Systems Competition Track, this competition challenges you to use Open Images, a large, multilabel, publicly-available image classification dataset that is majority-sampled from North America and Europe, to train a model that will be evaluated on images collected from a different set of geographic regions across the globe. The three geographical distributions of data in this competition. Competitors will train their models on Open Images, a widely used publicly available benchmark dataset for image classification which happens to be drawn mostly from North America and Western Europe. Models are then evaluated first on Challenge Stage 1 and finally on Challenge Stage 2, each with different un-revealed geographical distributions. In this way, models are stress-tested for their ability to operate inclusively beyond their training data. 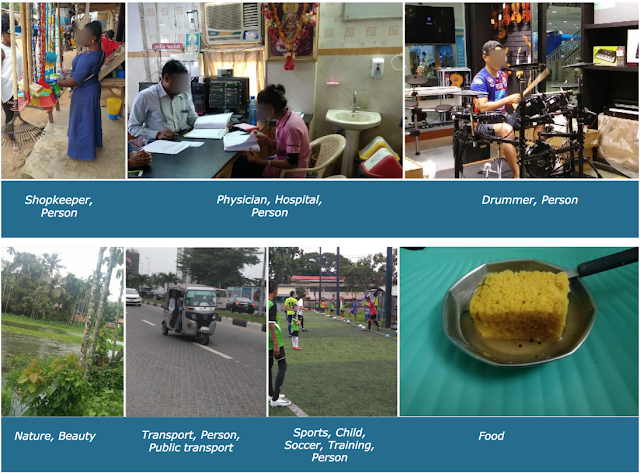 For model evaluation, we have created two Challenge datasets via our Crowdsource project, where we asked our volunteers from across the globe to participate in contributing photos of their surroundings. We hope that these datasets, built by donations from Google’s global community, will provide a challenging geographically-based stress test for this competition. We also plan to release a larger set of images at the end of the competition to further encourage inclusive development, with more inclusive data. The Inclusive Images Competition officially started September 5th with the available training data & first stage Challenge data set. The deadline for submitting your results will be Monday, November 5th, and the test set will be released on Tuesday, November 6th. For more details and timelines, please visit the Inclusive Images Competition website. The results of the competition will be presented at the 2018 Conference on Neural Information Processing Systems, and we will provide top-ranking competitors with travel grants to attend the conference (see this page for full details). We look forward to being part of the community's development of more inclusive, global image classification algorithms! We would like to thank the following individuals for making the Inclusive Image Competition and dataset possible: James Atwood, Pallavi Baljekar, Parker Barnes, Anurag Batra, Eric Breck, Peggy Chi, Tulsee Doshi, Julia Elliott, Gursheesh Kaur, Akshay Gaur, Yoni Halpern, Henry Jicha, Matthew Long, Jigyasa Saxena, and D. Sculley. This entry was posted in Research Blog and tagged Diversity, Image Classification, machine learning, Research on September 6, 2018 by Google AI Blog. Tiffany’s mother was born in Hong Kong. Her father was born in Vietnam. She is proud to be Chinese, Asian, and American. Aerica’s mother is Japanese from Kyoto, Japan and her father is Black, from College Station, TX. She identifies as Black and Japanese. 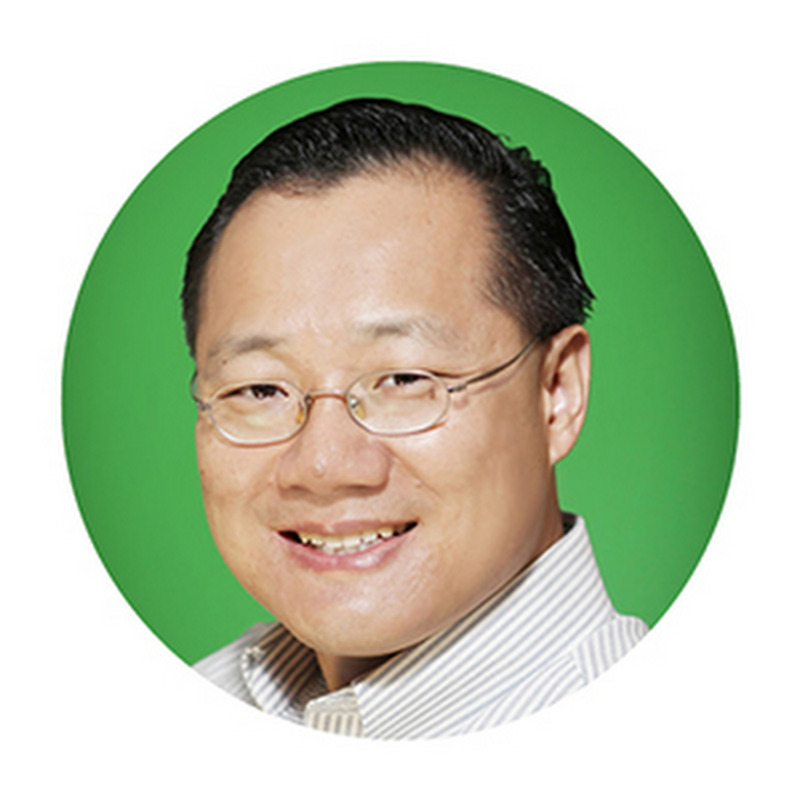 Together, we are the chairs of the Asian Google Network (AGN), whose mission is to support the diverse and multicultural Asian community at Google and beyond. Founded in 2007, AGN is open to all Googlers and provides an annual mentorship program, opportunities for civic and community engagement; leadership development; and curriculum to advance racial justice for all. We celebrate Asian American Pacific Islander (AAPI) Heritage Month every year in service to that mission. And for the 40th anniversary of AAPI Heritage Month, it was important to us to convey the diversity of the Asian experience in America. 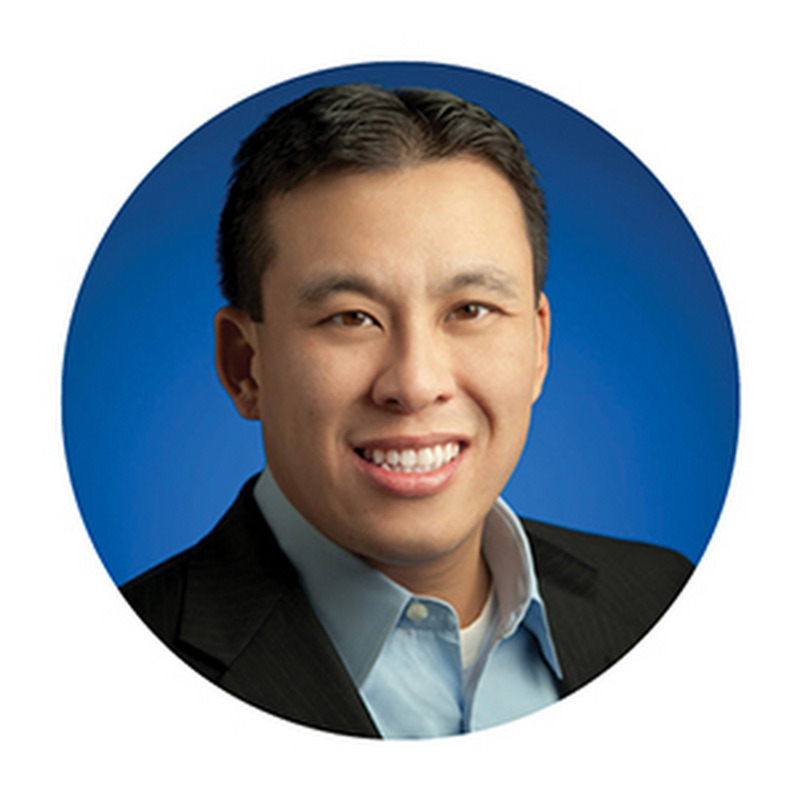 For example, Asians at Google trace their roots to more than 20 countries, are multiracial, multiethnic, and speak dozens of languages. And when Asian ethnicities are disaggregated, the data shows that there are wide chasms in access to education, income, and representation. That means that issues that impact AAPIs are broad as well. As part of this year’s AAPI celebrations, we created an internal curriculum for Googlers on Asian narratives called “We Are Many and One: Gathering Asian Narratives,” where participants share stories and find both common themes and differences within the Asian American Pacific Islander community at Google. Across the country, AGN chapters also put on events for their local communities, such as the exhibit organized by AGN Ann Arbor, which uses timelines, Supreme Court cases, poetry, and the stories of local Googlers to tell the history of Angel Island, the entry point for many Asian immigrants coming to the United States. To recognize the AAPI community outside of Google, we partnered with Google Expeditions to feature tours of “Hokule'a's Worldwide Voyage” and “Kamehameha: Unification of the Hawaiian Islands.” YouTube created a playlist of AAPI artists. 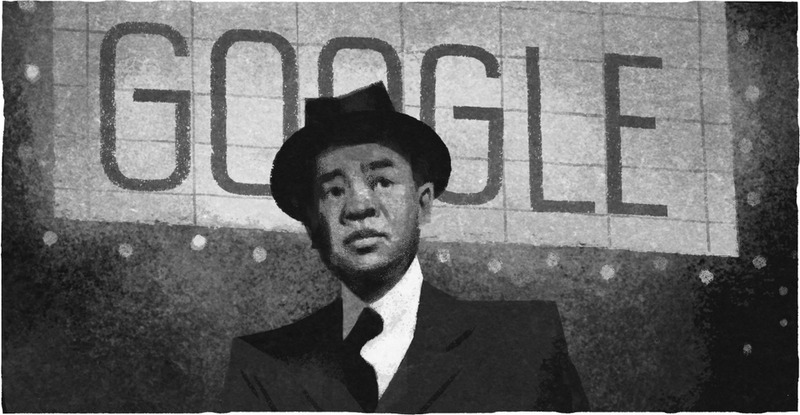 Google Assistant embedded 10 new AAPI facts activated by the question, “Hey Google, what’s up?” And just today, the Doodle team created a Doodle celebrating Chinese-American cinematographer James Wong Howe. In the spirit of celebrating our diverse community, we also spoke with several members of AGN to hear about why they participate in AGN, what this means to them, and who inspires them. Why does AGN matter to you? 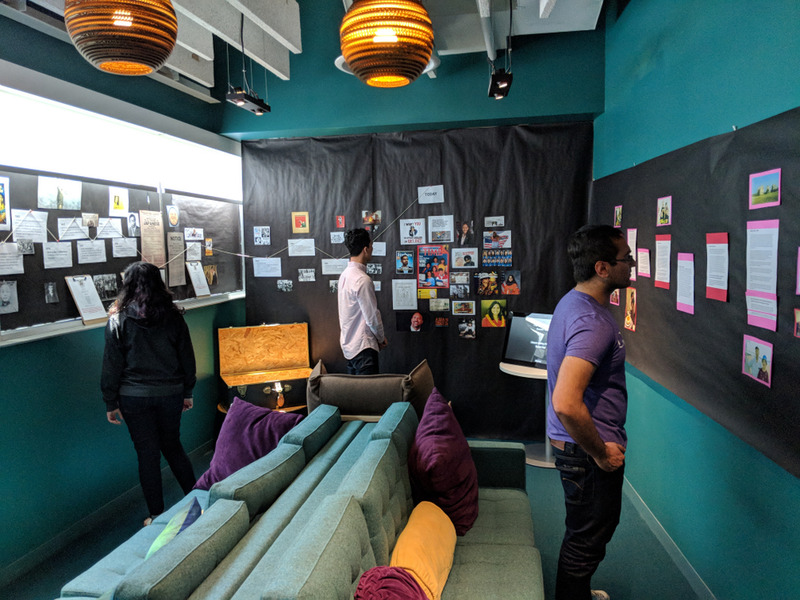 AGN provides a safe space where Googlers can share more about their own backgrounds, cultures, challenges they face, and help each other excel at Google and outside of Google. As an American-born child of Vietnamese immigrants, I have the "neither-here-nor-there" feeling of straddling two cultures. I have learned to embrace this state, and it's wonderful to meet fellow Googlers who share the same feelings! Tell us about your heritage. What makes you proud to be who you are? I still remain connected with my family's roots in India and make it a point to visit every year. I’m proud that India is a country of many different cultures and people that came together to form an identity. From Bollywood movies and music to colorful curries, elements of Indian culture are becoming popular across the world, and I am proud to share this with people in America and around the world. I am Native Hawaiian & Japanese, and I am incredibly proud to belong to an indigenous American culture. My father descends from Chief Kahekili, who was the last King of Mau'i until the Hawaiian Islands were unified in 1810. My mother's side brings in Japanese, as her grandparents migrated to Mau'i over 100 years ago for job opportunities following the Islands' agricultural boom. Who in the AAPI community inspires you? I have a lot of heroes in the AAPI community—Yuri Kochiyama, Grace Lee Boggs, Helen Zia. They are activists who strived to build coalitions with other communities of color and also give visibility and voice to the issues impacting the AAPI community. We hope you’ll join us this AAPI History Month in learning more about the AAPI community and working toward a more just and inclusive world. This entry was posted in Official Google Blog and tagged Diversity on May 25, 2018 by The Official Google Blog. Over one billion people in the world have some form of disability. That's why we make accessibility a core consideration when we develop new products—from concept to launch and beyond. It's good for users and good for business: Building products that don't consider a diverse range of needs could mean missing a substantial group of potential users and customers. But impairments and disabilities are as varied as people themselves. For designers, developers, marketers or small business owners, making your products and designs more accessible might seem like a daunting task. How can you make sure you're being more inclusive? Where do you start? Today, Global Accessibility Awareness Day, we're launching a new suite of resources to help creators, marketers, and designers answer those questions and build more inclusive products and designs. The first step is learning about accessibility. 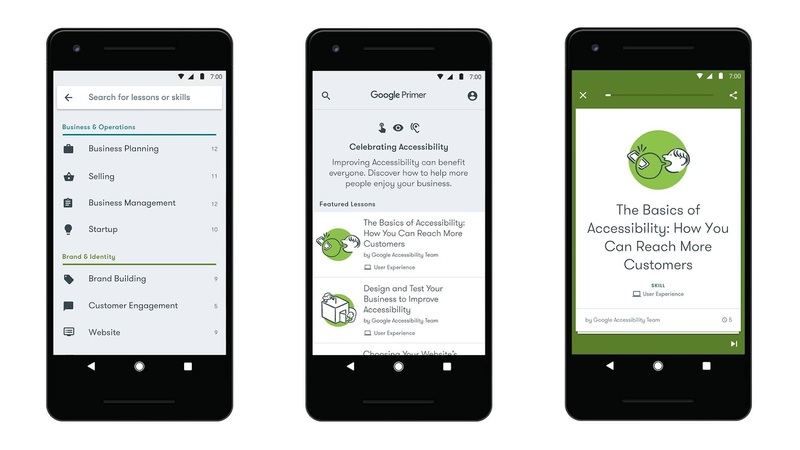 Simply start by downloading the Google Primer app and search "accessibility." You'll find five-minute lessons that help you better understand accessibility, and learn practical tips to start making your own business, products and designs more accessible, like key design principles for building a more accessible website. You may even discover that addressing accessibility issues can improve the user experience for everyone. For instance, closed captions can make your videos accessible to more people whether they have a hearing impairment or are sitting in a crowded room. Next, visit the Google Accessibility page and discover free tools that can help you make your site or app more accessible for more people. The Android Developers site also contains a wide range of suggestions to help you improve the accessibility of your app. We hope these resources will help you join us in designing and building for a more inclusive future. After all, an accessible web and world is a better one—both for people and for business. 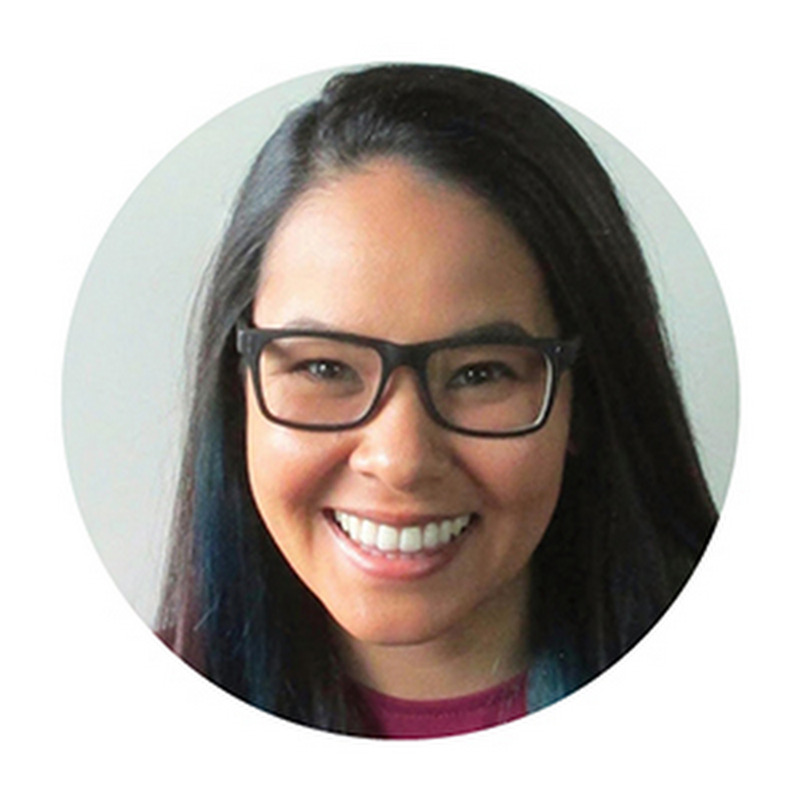 "Excited to see the new lessons on accessibility that Primer launched today. They help us learn how to start making websites and products more accessible. With over 1 billion people in the world with some form of disability, building a more inclusive web is the right thing to do both for people and for business." This entry was posted in Google Developers Blog and tagged accessibility, Design, Diversity, small business on May 17, 2018 by Google Devs. That’s why we make accessibility a core consideration when we develop new products—from concept to launch and beyond. It’s good for users and good for business: building products that don’t consider a diverse range of needs could mean missing a substantial group of potential users and customers. But impairments and disabilities are as varied as people themselves. For designers, developers, marketers or small business owners, making your products and designs more accessible might seem like a daunting task. How can you make sure you’re being more inclusive? Where do you start? Today, Global Accessibility Awareness Day, we’re launching a new suite of resources to help creators, marketers, and designers answer those questions and build more inclusive products and designs. The first step is learning about accessibility. 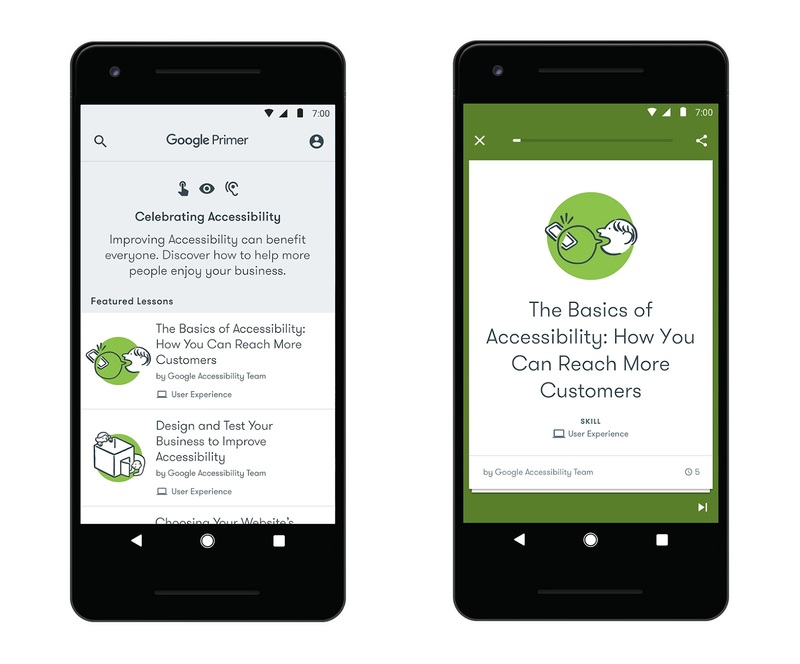 Simply start by downloading the Google Primer app and search “accessibility.” You’ll find five-minute lessons that help you better understand accessibility, and learn practical tips to start making your own business, products and designs more accessible - like key design principles for building a more accessible website. You may even discover that addressing accessibility issues can improve the user experience for everyone. For instance, closed captions can make your videos accessible to more people whether they have a hearing impairment or are sitting in a crowded room. This entry was posted in Official Google Blog and tagged Design, Diversity, small business on May 17, 2018 by The Official Google Blog. Last October as part of Grow with Google, we announced the Google Developer Scholarship Challenge—a joint effort with Udacity to help people across the U.S. unlock new jobs, new businesses, and new possibilities. The program provided scholarships to tens of thousands of learners across the U.S. to help them strengthen their mobile and web developer skills through curriculum designed with experts from Google and Udacity. This April, 5,000 of the top performers from the initial program also received scholarships toward a six-month Nanodegree program hosted on Udacity. 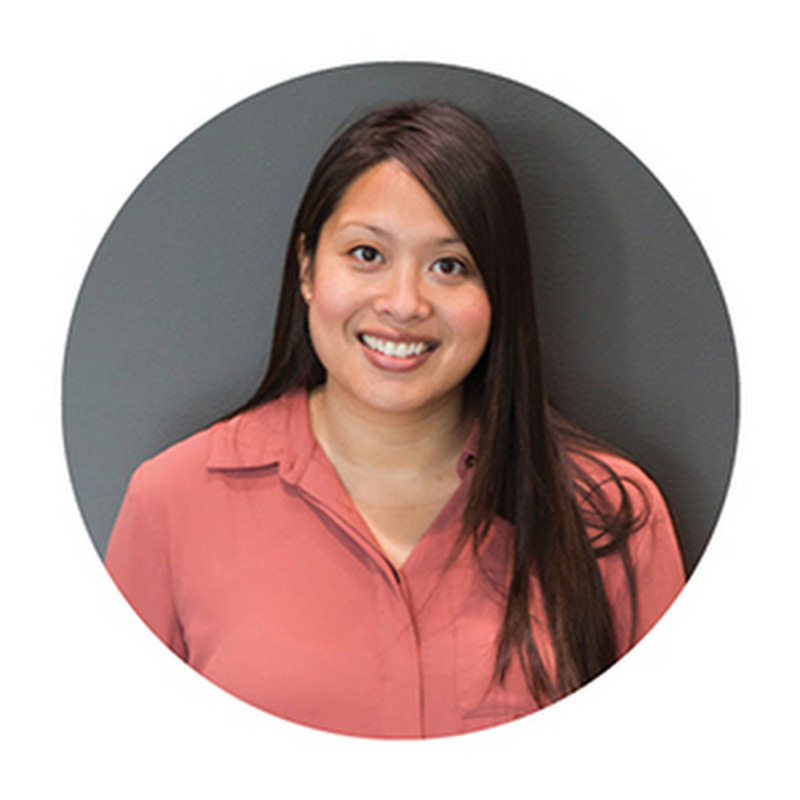 Sara Blevins is one of these talented individuals, who will complete the Front-End Web Developer Nanodegree program later this year. Last week, we invited Sara and some of her fellow scholars to attend Google I/O as special guests. We caught up with her to find out what I/O was like and what advice she has for other individuals looking to start a new career as a developer. 1. You went to I/O this past week! Tell us about that. The joy and awe I experienced was overwhelming, it welled up to the point where I couldn’t control it. Google to me isn’t a company, it’s the door in the back of the wardrobe that leads to Narnia. It’s the embodiment of the idea that an open, free, diverse, progressive, inclusive world isn’t too lofty a goal, it’s a reality we can all create together. 2. Raising kids, working a job, and further improving your web development skills as part of this developer scholarship all take a lot of hard work and time. Where do you find your motivation to keep going? For me, it isn’t that I need to stay motivated, it’s that I’m finally free and the question is, how do I remember that I need to sleep, eat, and relax. For most of my life, I’ve felt like a stallion that couldn’t run, an eagle that couldn’t fly, or a dolphin that couldn’t swim. Now, my cage door has been opened and I’m going to move forward as fast as life will permit me. I see wonder all around me, in even the simplest of things. I now have the ability to meaningfully contribute to that wonder. 3. You’ve talked about being told by others in the past that “it isn’t feminine” to be in science, technology, or math. What would you tell those same people today if they saw what you’re doing now? In the words of the monk who changed my life, “I open the door of my heart to you.” I understand the social conditioning that implanted that perspective in your mind. I also reject that conditioning, entirely. Now, watch me. 4. What’s one habit that makes you successful? Anyone who knows me and has for any length of time knows that I play the long game. I’ve been called obsessed and I embrace that—I wear it as a badge of honor. 5. What do you want to get better at? 6. What advice do you have for others who are starting their journeys to becoming developers? Embrace fear, self-doubt, discomfort, frustration, and failures. Not just embrace, but hold them close to your heart, nurture them and allow them to be yours. Because they are gifts, the most precious gifts life has to give; in those places are where we grow, push beyond what we are, and learn what we are capable of. This is hard—be harder. 7. Out of everything that happened this week, what new stories, knowledge, or perspectives do you think you’ll carry home with you? The open sharing of ideas, thoughts, perspectives, and gifts is the height of what we humans can aspire to in my opinion; at I/O, that’s what I witnessed in marvelous abundance. I was especially struck by the diversity and the drive to improve the human experience that seemed to the common threads running through the event. That spirit is now forever locked inside me, I feel renewed toward my overall goal of being a voice for women in tech. 8. And what are you looking forward to most about being back home? The arms of my babies… I can’t wait to show them the pictures, videos, and answer questions. I tell them as much as possible that if they are brave enough to be people who bring value to the world through their talents, actions, and thoughts, that they can literally create their own reality. I will push myself to my very limits to be the kind of person my babies can look up to. Also, I’m legit going to curl into the fetal position and sob uncontrollably if I don’t get to play my Xbox immediately. This entry was posted in Official Google Blog and tagged developers, Diversity on May 17, 2018 by The Official Google Blog. As a woman, a mother to an amazing daughter, a sister, a wife, a leader and a passionate women's rights advocate, it’s been incredible to bear witness to the groundswell of support for gender equality this past year. We’ve watched women find their voices, and seen the world begin to listen more actively. In fact, over the last year, the world has searched for "gender equality" more than ever before. People are not just asking questions; they are looking for ways to understand inequality, seek inspiration, speak out, and take action. This International Women’s Day, we’re recognizing what the world is searching for, and celebrating the strong, courageous women who are pushing us toward a more equal future. On our homepage today, we’re commemorating women whose stories are not often heard. Through an interactive Doodle, we’re highlighting the voices of 12 artists from all around the world, each sharing a personal story of a moment or event that impacted her life. Each artist featured in the Doodle tells a unique story, yet the themes are universal, reminding us how much we have in common. To make it easier to find women-led businesses on Google Maps and Search, we launched a new attribute that highlights local businesses that are owned, led, or founded by women. 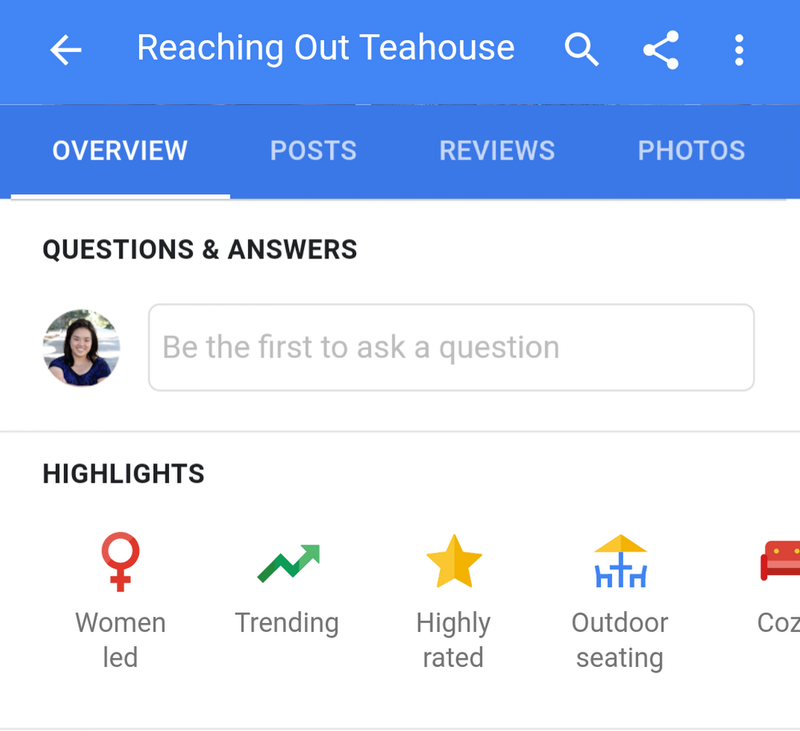 Now you can find more businesses like Reaching Out Teahouse in communities across the world. Tune in on YouTube at 11:45 a.m. ET tomorrow, March 8 to hear from Oprah Winfrey, Storm Reid, Gugu Mbatha-Raw and director Ava DuVernay of Disney’s “A Wrinkle in Time” for a special International Women’s Day Talks at Google event. The cast will be joined by 40 teen girls from Girls Inc as a part of a Made with Code event. Explore top-searched trends around women at g.co/womensday. Support the women behind great apps and games as well as strong female protagonists in games, movies, TV and books on theGoogle Play store. Follow the conversation at @WomenTechmakers as over 20,000 women in tech connect and inspire one another during our annual Women Techmakers International Women's Day events in 52 countries. Watch the Merrell Twins’ new YouTube series “Project Upgrade,” premiering Saturday, March 10. Follow two YouTubers as they build and code their own product, all the while showing girls the unlimited possibilities of CS and STEM. Here’s to supporting women everywhere in the search for a more equal future. This entry was posted in Inside Search Blog and tagged Diversity, doodles, Google Search, Seach, Search, Search Engine on March 8, 2018 by Lorraine Twohill. Growing up, Black history lessons in school were limited to Dr. Martin Luther King, Jr., George Washington Carver and Harriet Tubman. It wasn’t until I found my local public library—and with guidance from friendly librarians—that I began to understand the full breadth and depth of the impact of Africans in America. As a little Black girl growing up in white suburban Maryland, these lessons at the library, reinforced by conversations with my parents, were necessary to shaping a healthy identity as a Black woman. As I studied my history, I learned that Harriet Tubman overcame her small stature and birth into slavery as, not only a brilliant conductor on the Underground Railroad, but a strategist who led the first military maneuver executed by an American woman. I learned that Jesse Owensovercame his childhood as a sickly sharecropper’s son to become an Olympic gold medalist. I learned that Black Americans in the South left what was familiar to migrate by the millions toward opportunity in the North, Midwest and West Coast. And I fell in love with the poems of Langston Hughes, who articulated the pain and the beauty of the Black experience in words that perfectly expressed what I had—until then—only felt. In a special video series, YouTube creators talk about the individuals creating Black history today. Take a journey in VR with Black history lessons in Google Expeditions. Listen a YouTube playlist oficonic Motown artists curated by influencers like Lebron James, Bethann Hardison, Morgan DeBaun, Mellody Hobson, Veronica Webb and Van Jones. Search “Black History Month” on Google and see posts by verified organizations like the NAACP. We’ll share more about Black history on Google Arts and Culture throughout the month. If you’re a cultural organization that features Black history collections, reach out to Google Arts and Culture via this form—we’re always looking to expand the range of works of art, archives and stories available on our platform. This entry was posted in Official Google Blog and tagged Arts & Culture, Diversity on February 7, 2018 by Chanelle Hardy.